Democracy; Economic aspects; United States. Leading political economist and bestselling author Robert B. Reich presents a paradigm-shifting, clear-eyed examination of a political and economic status quo that no longer serves the people, exposing one of the most pernicious obstructions to progress today: the enduring myth of the âfree marketâ when, behind the curtain, it is the powerful alliances between Washington and Wall Street that control the invisible hand. Laying to rest the specious dichotomy between a free market and âbig government,â Reich shows that the truly critical choice ahead is between a market organized for broad-based prosperity and one designed to deliver ever more gains to the top. 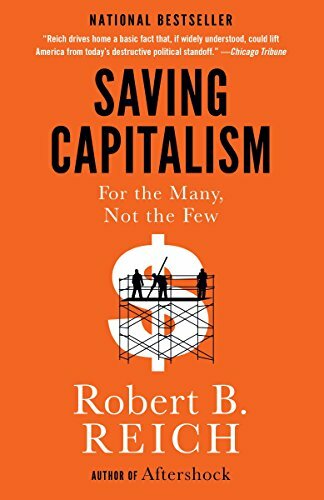 Visionary and acute, Saving Capitalism illuminates the path toward restoring Americaâs fundamental promise of opportunity and advancement. About: From the author of Aftershock and The Work of Nations, his most important book to date—a myth-shattering breakdown of how the economic system that helped make America so strong is now failing us, and what it will take to fix it. About: Now a Netflix Original DocumentaryAmerica was once celebrated for and defined by its large and prosperous middle class.